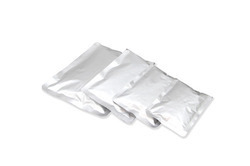 Our range of products include liquid packaging pouches for oil and chemical pouches. We are offering Liquid Packaging Pouches for Oil, The pouches offered by us help in maintaining flavor, aroma, freshness and purity of oil for a longer period of time. These pouches are made available in different sizes, styles as well as color options. Other than this, we offer these products to our clients at industry leading prices. We are the manufacturers and supplier of the Chemical Pouches.